Today, I was sitting on Emma’s bed, (watching a dance party that I was invited to) when I caught her checking her self out in the mirror, fussing with her hair, tucking it behind her ears, patting her little pink cheeks. When she saw me watching her, she gave me her best, "sto-op! ", sassy-teenager exclamation. Whoa, a glimpse into my future. Also in my future, are thanksgiving table name cards. 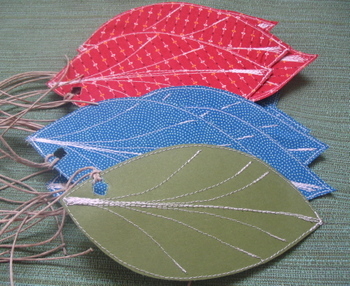 I’m thinking of bringing back these fabric leaves that I stitched on cardstock awhile back for dacia’s tag swap. I was going to post a picture of the Fall fabrics I was pulling out for these, but just wanted to get started. I need to close down the old laptop and get busy. It is the perfect day for sewing–heavy rain, dark skies….Emma is sitting on my bed hand-sewing a pouch. Now the only thing missing for the two of us is some music and a little cup of tea. 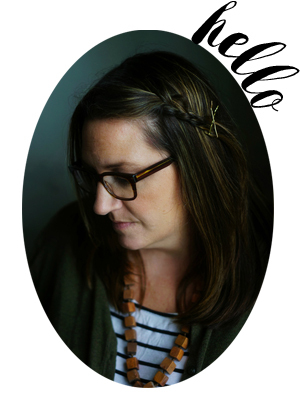 oh, and have you seen abby’s polka-dot garland? I’ve got to get my hands on a circle punch like that! I love it! and I feel so lucky: I snatched up one of melissa’s fabulous box bags in exchange for some pendants and such from my shop. thank you, melissa. I can’t wait. OH dear…not teenage talk yet. Please no.Those leaves are beautiful and would be perfect for Thanksgiving.Circle punches are lots of fun. You must get some! i lovemelissa’sbox bags-how lucky!and yourtags arewonderful-i certainlycherish mine! those are so pretty Molly, why did I never see these? They would make really lovely placecards. Teenagers, I shudder at the mere mention! Those tags will make great placecards! I remember always enjoying deciding where people would sit when I was little. Ooh, teen sass already! I hope it was fleeting! Okay, I’ve tried sewing on paper and my needle keeps breaking or jamming the thread…what am I doing wrong? What size needle are you using and how often are you replacing it, if I may ask?